The brighter colors that the Cuban Crocodile features gains it plenty of attention. They have scales with a different appearance too – like it has small pebbles in it. Sadly, the distribution of the Cuban Crocodile isn’t nearly what it used to be. The Caribbean is one of the places where it used to thrive but is no longer found at all. Today you will only see them in certain areas of Cuba. This includes Isla de la Juventud and the Zapata Swamp. They are found at Gatorland in Florida as well in captivity. Since they are only found at this time to be living in freshwater some people assume that is they only place they can be. However, they are able to successfully thrive in saltwater. When they have the choice though they will choose the freshwater first. For those in captivity freshwater is what they are offered. Careful testing by experts shows that the Cuban Crocodile is the most intelligent of all the species out there. What is interesting is that when they need to work as a team they will. For example they will swarm around a large animal in the water and all take it down. Then they frenzy for getting some of that food before it is gone will occur. They are mostly solitary animals though with this exception. They are only documented to feed in such a manner in certain locations though. It is believed this is an adaptation of their environment rather than a behavior of this particular crocodile species. They do feed upon quite a few different types of animals out there. The younger Cuban Crocodile is likely to consume insects, turtles, and fish. As they get larger and stronger they will move on to larger mammals. They have powerful jaws and teeth to hold them and to tear them apart. In some areas they will use their tails to hit the trunk of trees. This will cause small animals in the trees to fall out and be consumed. The mating season is longer for the Cuban Crocodile . It starts in May and lasts through August or September. The female will create from 30 to 40 eggs and deposit them into a nest she made on the shore. It takes from 60 to 70 days for them to hatch. The hotter it is the faster they will emerge. The heat will also decide if they are males or females. Lower temperatures will result in female offspring. In the wild there is a very high mortality rate of these young. Many of them are consumed by birds and other predators. Cannibalism is very high among this species of crocodile as well. Only about 1% of them will live for one year or longer. This is part of the reason why it is such a struggle to get their population to increase in the wild. 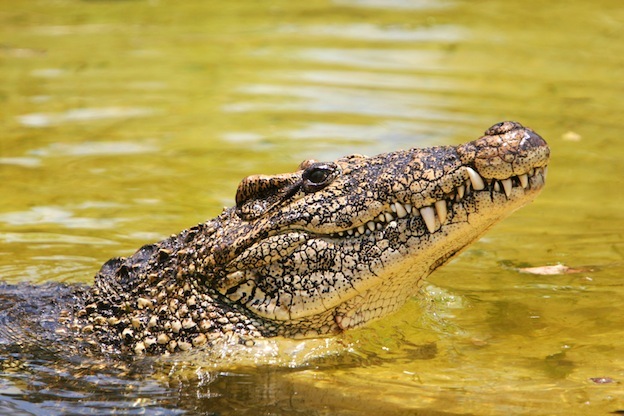 The Cuban Crocodile is considered to be critically endangered at this time. The fact that it has a very small natural habitat left is a reason for concern. One of the efforts in place in the Untied States involves breeding programs. These crocodiles are raised in captivity which allows more of the offspring to be able to survive. The goal is to be able to help these animals increase in population in the wild too. There are some projects in the works to see about introducing them again to the Caribbean. This may be the way to get their numbers in the wild to once again be more plentiful.